Durban - New Zealand will not be distracted by the axing of former captain Ross Taylor ahead of their cricket tour of South Africa, new skipper Brendon McCullum said on Friday. "We can't control what has unfolded back home and, as players, our focus is very much on the cricket field and what we can control there," McCullum told a news conference. "What has happened behind the scenes over the last little while is, from a team perspective, now over and our focus is now moving forward." Taylor was stripped of the one-day and Twenty20 captaincy last week and rejected an offer to stay on as test captain while also making himself unavailable for the South Africa tour which includes three T20 internationals, two tests and three one-day games. Former players criticised New Zealand Cricket (NZC) for their handling of the situation and ex-batsman and coach Mark Greatbatch called on the body's chairman Chris Moller to step down. Moller has issued a public apology to Taylor for the way that his sacking was handled. 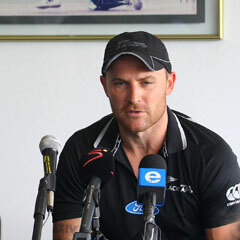 "There have obviously been some distractions going on back home over the last week or so," McCullum said on Friday. "We know about the monumental task in front of us and to take it on without some of our better players is disappointing but that is the way it has unfolded." Taylor is arguably New Zealand's best batsman at the moment and McCullum said he would be missed. "He is going to be a big loss; we have a number of big losses right throughout our team. It is one thing to long for those guys to be present but it is another thing to get on and deal with the resources you have got. "From a leadership point of view you have got to find a way to be able to use the resources that we do have rather than the ones that we don't. "Ross has made himself unavailable at this stage and that is unfortunate but hopefully he will be back for the next tour," he said. New Zealand coach Mike Hesson, whose recommendation led to Taylor's sacking, said the former skipper's absence would give new players a chance to establish themselves in the team. "There is no doubt that without (all-rounder) Daniel (Vettori), with his injury, and Ross we won't be as strong with the bat but that also gives opportunities to other people to stand up and that is an exciting thing," said Hesson. The first T20 game of the tour is in Durban next Friday.